Stroke the heart of your lady love with a tender touch of your feelings for her by presenting her this Heavenly Dazzle 30 Red N White Roses Collection and intensify the passion connecting you both. This Collect displays Dynamic Red and White Roses tied together by Nifty Ribbons and enhanced with Leaves of Colour Green. Stroke the heart of your lady love with a tender touch of your feelings for her by presenting her this Heavenly Dazzle 50 Red N White Roses Collection and intensify the passion connecting you both. This Collect displays Dynamic Red and White Roses tied together by Nifty Ribbons and enhanced with Leaves of Colour Green. 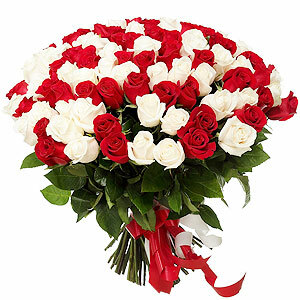 Stroke the heart of your lady love with a tender touch of your feelings for her by presenting her this Heavenly Dazzle 100 Red N White Roses Collection and intensify the passion connecting you both. This Collect displays Dynamic Red and White Roses tied together by Nifty Ribbons and enhanced with Leaves of Colour Green.